On March 26, reports surfaced that Ukraine had effectively moved towards the completion of a long-delayed deal to supply tanks to Thailand. Though the reports were merely the latest in a string of comments indicating Kiev’s urgency to fulfill its previous obligations, they do once again place emphasis on the significance of the deal not only on its own terms but for relations between the two countries and for the future of the tank itself. As I have noted previously in these pages, though Thailand had signed a deal to procure up to 49 T-84 Oplot tanks from Ukraine for over $240 million back in 2011, delivers were delayed due to the conflict in Ukraine and economic challenges that Kiev had experienced. Despite these delays and Bangkok’s turn to other sources on this front, including China, deliveries of the tanks had continued on into 2017 (See: “What’s Next for China-Thailand Military Ties in 2018?”). Indications were that the deal would finally be effectively completed around the end of the first quarter of 2018. On March 26, Pavlo Bukin, the Director General of state-owned defense industry group Ukroboronprom, declared that the deal had effectively been completed, with the batch of combat vehicles successfully passing a test in the presence of Thai defense officials the tanks soon be being sent to Thailand to completing the deal. Bukin was blunt about the state of affairs, noting that the contract was fulfilled despite the challenges Ukraine faced, including “Russia’s unfair competition and military aggression,” and thanking Bangkok for its understanding of the obstacles that Kiev had to overcome to realize the deal. The broader significance of this development beyond the deal itself remains to be seen. The deal’s completion does technically remove an obstacle to Kiev and Bangkok moving forward on opportunities to expand their defense partnership that have been discussed earlier, including on military technology transfer, defense industry, and even the joint venture on a military production facility. But Ukraine is only one of the countries on an increasingly longer list of defense partners for Thailand that also includes Russia and China, and there are various considerations about how Bangkok will choose to proceed here that go beyond the delayed fulfillment of a single deal (See: “What’s Behind the New US-Thailand Military Facility Hype?”). As for the Oplot tank itself more generally, Bukin unsurprisingly noted that with the fulfillment of the contract, the focus would be on producing tanks for Ukraine’s military. That itself will require several significant steps with respect to the tank, including controlling costs, making renovations and upgrades on certain components, and addressing other research, development, and production concerns. 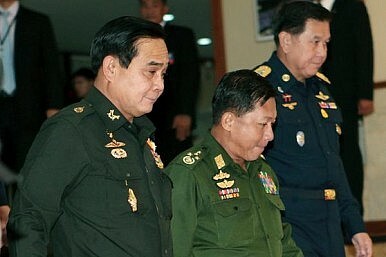 Thailand Will Buy 10 More Tanks From ChinaMore China Battle Tanks for Thailand?What’s in Thailand’s New Military Helicopter Order?Thailand’s Military Forges Ahead with Israel Artillery SystemWhat’s Next for Russia-Thailand Military Ties?